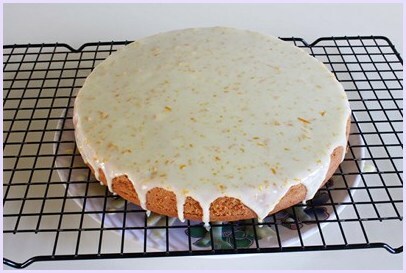 Eggless orange cake recipe – very EASY to make that baking beginners can also make it. It will require very basic ingredients. 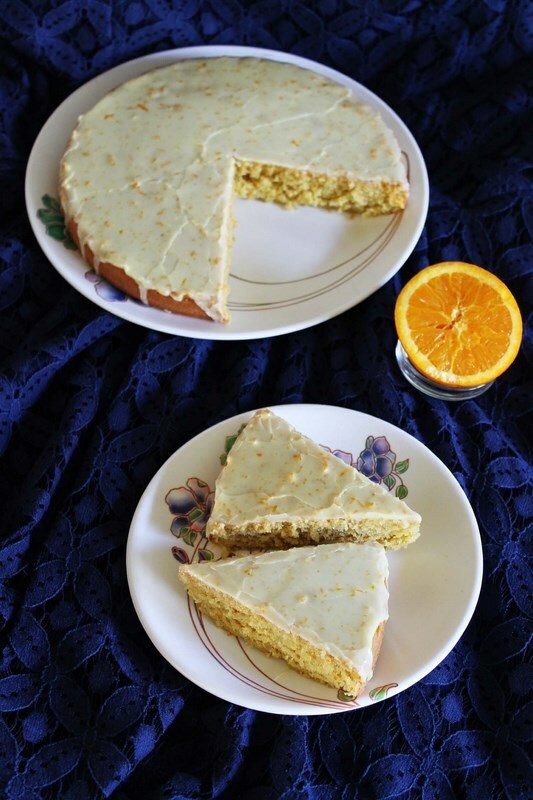 This is also vegan orange cake recipe. 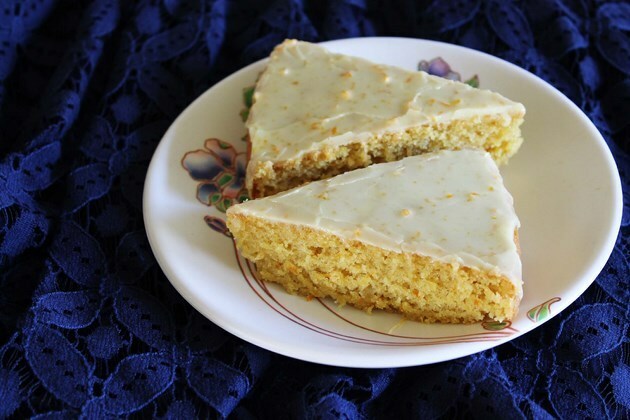 This is very light, spongy and moist cake with full of orange flavor. The icing is also orange flavored, so it is double dose of it. Here I have used freshly squeezed orange juice. You can use store bought juice but I strongly recommend to use the fresh one which gives the best flavors. The downside of using store bought juice is that you won’t have zest. As a result you will miss the orange flavor in the cake. In that case, you add few drops of orange extract. 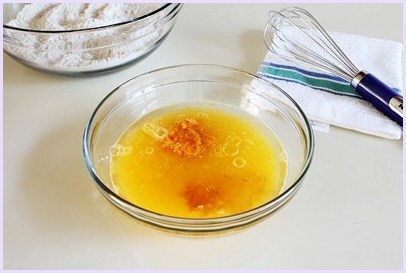 Whenever you bake anything with oranges, the smell or aroma will be all over your kitchen and house. It just smells divine that I can’t have patience till cake gets cool off. But sadly, I have to wait till it cools completely and then have to wait till icing dries out. Huh life is hard!! 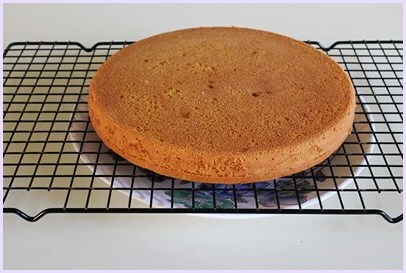 I always love chocolate cake but dear hubby always love cake made with citrus like this eggless orange cake or lemon cake. I have made this round cake. But you can make it in cupcake form as well. Only baking time will be less. After having a slice, your stomach will not feel heavy because it is so light. Give it a try and let me know how you like it. 1) Pre-heat the oven to 375 degrees F or 190 degrees C for at least 10 minutes. 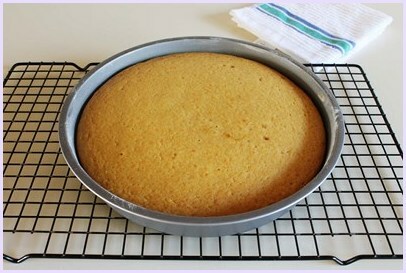 2) Butter and flour 9 inch round cake pan. Lightly grease it with butter or spray with nonstick cooking oil spray. Then sprinkle about a tablespoon of flour. Now swirl the pan so flour will stick to greased surface (all over pan and also around the edges). Now invert the pan over a sink or garbage and tap it gently with your hand to remove excess flour. 3) Keep it aside your prepared cake pan. 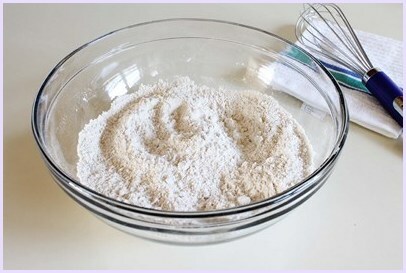 4) Take dry ingredients in a bowl (cake flour, baking powder, baking soda, salt and brown sugar). 5) Whisk it well so everything gets incorporated. 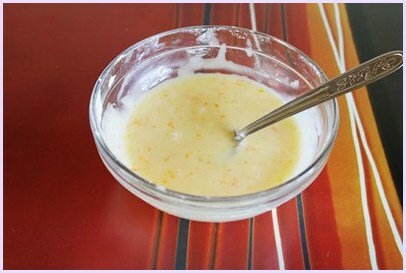 6) Now in another bowl take wet ingredients (oil, orange juice, vanilla extract, vinegar) in a bowl along with orange zest. 8) Add wet to dry. 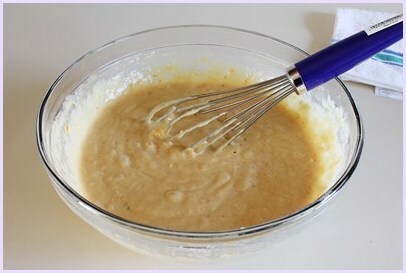 9) And whisk till all comes together and becomes a smooth batter. 10) Now pour the batter into prepared pan. Tap it lightly on you counter, it will help to remove air bubbles from batter. 11) Bake it into pre-heated oven for 25-30 minutes. Always check 2-3 minutes before mentioned time. Check by inserting a toothpick in the center of the cake. If it comes out clear then cake is ready. 12) Let it cool in the pan for at least 10 minutes. Then run the knife around the edges to loosen the cake. And remove it to the cooling rack. Let it cool completely before decorating or spreading icing. 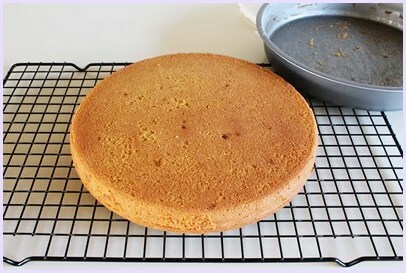 13) Now cake is cooled completely. 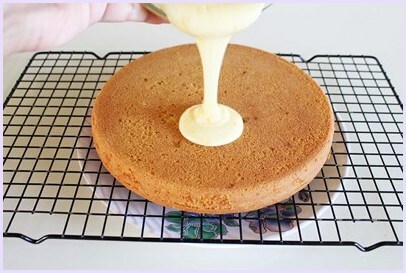 Before we make and drizzle the icing on the cake, put the plate at the bottom the cake for easier cleaning. 14) Let’s make orange flavored icing. 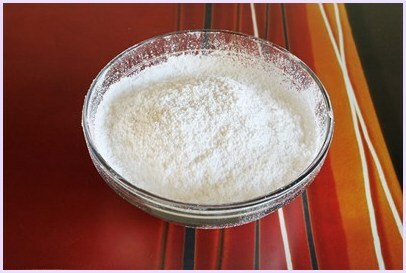 Take powdered sugar or icing sugar in a bowl. 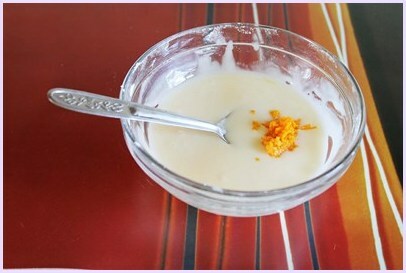 15) Start adding tablespoon of orange juice at time and keep mixing till you get smooth and pouring icing consistency. 16) Add orange zest to the icing. 18) Now drizzle the icing on the cake and let it flow itself. Let the icing dry completely before you slice the cake. 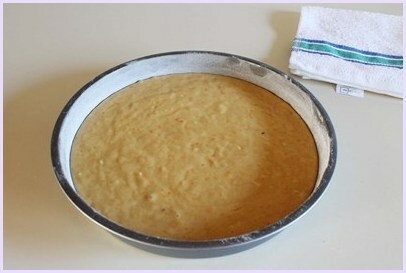 Storing the Cake: It stays good for 2 days at room temperature and 4-5 days in refrigerator. But the next day, icing will get soften, but sure tastes good. Serving suggestion: Enjoy this as a dessert. You can make this as a birthday or special occasion cake. 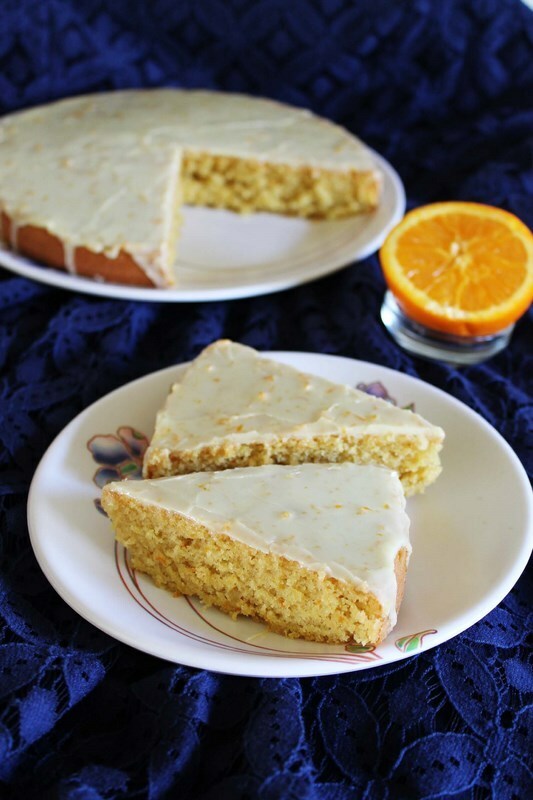 This eggless or vegan orange cake is very light, spongy and moist cake with full of orange flavor. It has orange frosting on top. Orange zest from half of the orange. Pre-heat the oven to 375 degrees F or 190 degrees C for at least 10 minutes. 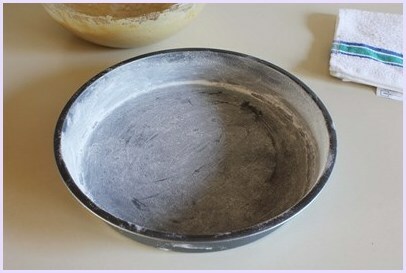 Butter and flour 9 inch round cake pan. Keep it aside your prepared cake pan. 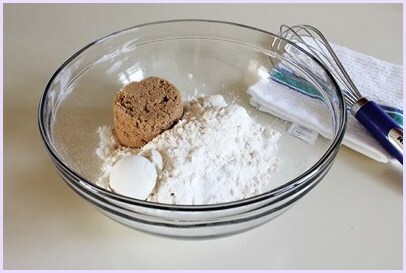 Take dry ingredients in a bowl (cake flour, baking powder, baking soda, salt and brown sugar). Whisk it well so everything gets incorporated. 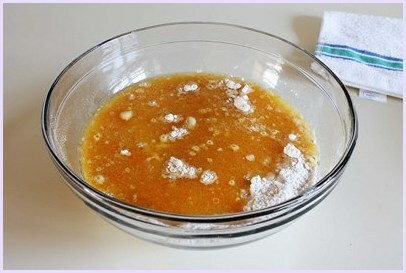 Now in another bowl take wet ingredients (oil, orange juice, vanilla extract, vinegar) in a bowl along with orange zest. 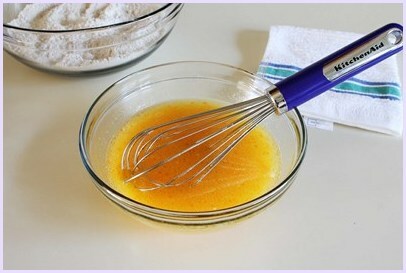 And whisk till all comes together and becomes a smooth batter. Now pour the batter into prepared pan. Tap it lightly on you counter, it will help to remove air bubbles from batter. Bake it into pre-heated oven for 25-30 minutes. Always check 2-3 minutes before mentioned time. Check by inserting a toothpick in the center of the cake. If it comes out clear then cake is ready. Let it cool in the pan for at least 10 minutes. Then run the knife around the edges to loosen the cake. And remove it to the cooling rack. Let it cool completely before decorating or spreading icing. 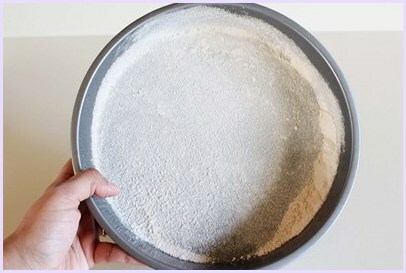 Take powdered sugar or icing sugar in a bowl. 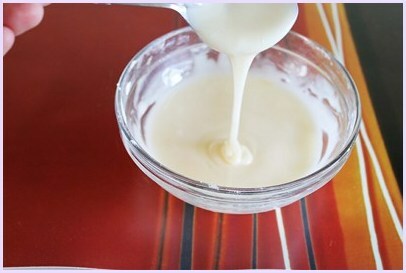 Start adding tablespoon of orange juice at time and keep mixing till you get smooth and pouring icing consistency. Add orange zest to the icing. Mix it well. put the plate at the bottom the cake rack for easier cleaning. Now drizzle the icing on the cake and let it flow itself. **Make cake flour at home: 1 ½ cups of cake flour is equal to 1 cup + 2 tablespoons all purpose flour with 3 tablespoons tightly packed corn flour or corn starch. Alternately you can use 1 ½ cups of all purpose flour Instead. But cake flour gives light, spongy texture. ** zest is outer orange part of the fruit. Grate it using fine grater and do not grate the inside white part which is bitter. I would like to make a lemon cake. Could i use lemon juice and lemon zest instead of orange? I am guessing quantities may vary slightly? Hi, I’m planning to make this for my daughter’s first birthday. Is 190C for a fan oven? Or do I need to reduce the temperature a little for my fan oven? Thanks! Not sure what do you mean by fan oven? I have never worked with that kind of oven. You can do the test run and see before the birthday party. Ok thanks. In the UK most ovens have a fan to distribute the heat evenly throughout the oven. Cooking temperatures are usually reduced by about 20 degrees C for these fan ovens. oh ok. Good to know. This was delicious! Exactly what i wanted and turned out like something from a real bakery! Hey I tried this cake today. Upon inverting the cake it just crumbled to pieces. The taste is outstanding but I don’t know what went wrong. Also I found the liquid proportion in my batter high. Any pointers? The came becomes crumbly if it is over baked. Try baking a few minutes less next time.